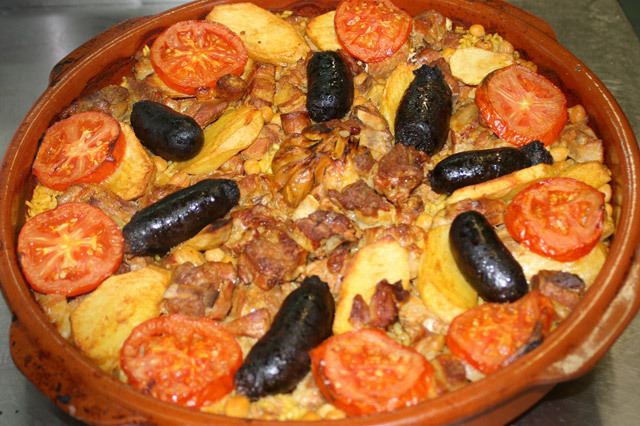 This is a typical dish from Valencia and is baked in the oven, as indicated by the name itself. Although Valencia is known for paella, there are many other mouth-watering rice dishes to enjoy, like arroz al horno. Unlike paella, arroz al horno is prepared in a clay pot. Arroz al Horno is humble in its origins, made using leftover stew, which is why the ingredients include chickpeas, pork ribs and morcilla sausage. Note: Tradtionally, this dish is prepared in a clay or ceramic dish. So, you’ll need a ceramic, enamel or stainless steel casserole dish that can be used in the oven. Cut the pork into cubes approximately 3/4 inch. Cut the morcilla sausage into thick slices. Cut tomatoes into slices approximately 1/3 inch thick. Peel potatoes and cut into slices approximately 1/4-inch thick. Pour a few tablespoons of olive oil into the casserole dish and heat. When hot enough, fry the pork, sausage slices and whole head of garlic. Add slices of one tomato and stir. Add the rice into the pan and stir the frying pan. Add olive oil if necessary. Pour the broth, salt and saffron and sprinkle the chickpeas around the dish. Simmer for 10 minutes while you fry the potatoes. Add more broth if necessary. In a small frying pan, heat approximately half-inch of olive oil in a small frying pan. When hot enough, add the potato slices. Lightly fry them and remove. Add the rest of the tomato, laying slices on top. Place potatoes slices on top of the rice. Cover and bake in the oven until golden brown.